The unceasing bloody clashes between security agencies and members of the Islamic Movement in Nigeria (IMN) otherwise known as Shiite Muslim sect have again exposed the need for the nationâ€™s security apparatus to up their game particularly, as it relates to inter-agencies intelligence gathering and sharing in their bid to nip in the bud potential threat to internal peace and security before it gets out of control. The latest bloody clash arose from a protest match against the continued detention of Ibrahim El Zakzaky, leader of the sect. He was arrested in Zaria, Kaduna State on December 12, 2015, in the aftermath of a bloody clash between his followers and security forces. During Tuesdayâ€™s clash, several lives were reported lost and many more were injured. The protest match had lasted three days (as at the time of filing this report). A police vehicle was also reportedly set ablaze by members of the sect. Trouble had begun when the protesters proceeded towards Amigo area in Wuse 2 amid heavy security presence. Findings have shown that El Zakzaky had for long carried on as if he was above the law. He reportedly ruled his Gyelleus community in Zaria where he lived like a state of his and not answerable to the nationâ€™s laws. Several accounts had it that his followers molested residents of different parts of Zaria especially, Gyelleus until his arrest. 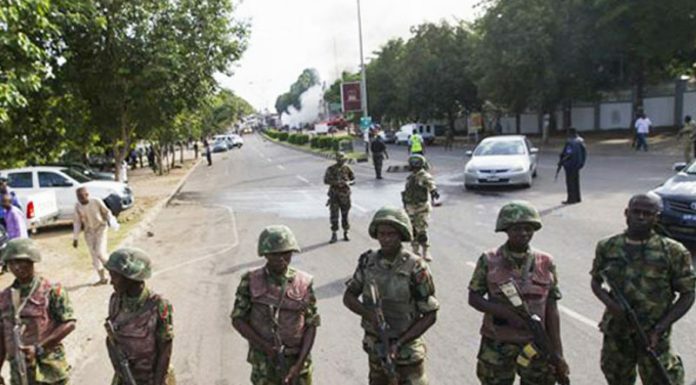 But matters reached a head on December 12, when members of the sect, allegedly led by El-Zakzaky, on a procession waylaid the convoy of the Chief of Army Staff (COAS), Lieutenant General Tukur Buratai, who was in town for an assignment. Violence eventually broke out when the military with the support of Mobile Police Unit, after failed several appeals, forced them off the road to enable the COAS to continue with his journey. Then the army claimed it got intelligence report that the group, not pleased that their procession was â€˜disruptedâ€™, had mobilised other members for whatever action; and so the military stormed their bases in Gyelleus, Hassaniya and Danbo road, leading to several casualties and the eventual arrest of El-Zakzaky, his wife and some of his members. Addressing the media in the aftermath of the clashes and El-Zakzakyâ€™s arrest, General Officer Commanding 1st Mechanised Brigade of the Nigerian Army Kaduna, Major General Adeniyi Oyebade, had said, â€œâ€¦And because of the report, we heard that they were mobilizing at their three key strong points, including the big temple called the Hussaniyya, the area occupied by the sect leader in Gyelleus and another temple somewhere on Danbo road, I decided that I had to bring the situation under control by securing those three sites. However, the latest clashes had raised a few questions including the rationale behind the continuous detention of El-Zakzaky. Observers have questioned the legality or otherwise of the continued detention of El-Zakzaky. Many commentators initially lampooned the administration for not releasing the sectâ€™s leader after the court ruled that he should be released. The call for his release gained so much traction that the government struggled to justify his continued incarceration. However, justifying governmentâ€™s refusal to release him, Minister of Information and Culture, Alhaji Lai Muhammed had told THISDAY in an interview that, â€œEvery government in the world will at a point in time balance individual freedom with national security. Let me take the first case of El Zakzaky. I think people are just being mischievous; people have expressed a lot of ignorance in respect to El-Zakzaky. â€œYes, El-Zakzaky has not been released but where is El-Zakzaky today? Is he in prison custody? Is he in police custody? No. He is in a house provided by the government with his family. Why? It is because the court order said we must release him within 45 days, rebuild his house and there is nobody today within Kaduna State or anywhere else that wants to accept El Zakzaky as a neighbour. The sect was quick to lose the initial sympathy it had enjoyed. Many observers who hitherto shared in the anger and saw reasons with them for protesting peacefully turned their backs on them the moment they resort to violent protest and attacked police and innocent citizens in the process. â€œFor me, they stepped out of line the moment they turned violent in their protest. You donâ€™t vent your anger on innocent people and still enjoy the support of the public; he who comes to equity must come with clean hands,â€ stated Dr. Kolade Adams of the department of political science, Lagos State University (LASU) Ojo. Other commentators, however, took the argument further and argued that there was the need to check the sect before they become another deadly insurgency group given their propensity for violence. One such observer is a public affairs commentator and aviation consultant, Olumide Ohunayo. In his view, the sectâ€™s boldness has for long been known in and around Zaria but taking it to the nationâ€™s capital has the capacity to disrupt peace and order adding that its last clashes were capable of affecting tourism. â€œI think the government needs to have a rethink on the kind of force that is being used now. It is very glaring that the police cannot handle members of the sect considering the boldness and the brute force which they have demonstrated so far, because what we see is that they start peacefully and then turn violent, whether it was hijacked by hoodlums or not is still to be seen. â€œThis is a group that has shown over time that they fear no foe. What people see is that they are not armed, but when you brazenly block the road against other road users, when you haul stones at policemen or innocent people then you have used an element of force and when you do so, it is appropriate that government must deploy force to restore law and order. I also feel that the government should find a way to allow their leader to have some level of freedom. However, what is paramount now is that this is a group that must be tamed,â€ he maintained. Even with the call on the government to be tough on and tame the Shiite sect, other observers also questioned the use of excessive force to manage the situation. Those in this school insisted that firing live bullets at members of the sect betrayed lack of better protest management strategy. Indeed, firing live bullets has gone extinct in civilised societies, rather, government forces are known to fire rubber bullets with less fatality ratio at protester to disperse them. But with the way both parties had prosecuted their causes in the clashes, it simply pointed to the fact that they are same of a kind. Some analysts, however, argued that the more fundamental question to ask was how did El-Zakzaky become so emboldened and audacious leading to what he is today? How did his activities escape the intelligence gathering capability of the nationâ€™s security apparatus, and how come he was able to indoctrinate his followers so much so that they were ready to lay down their lives for him? But Ohunayo traced El Zakzakyâ€™s ability to indoctrinate his followers to the low level of education in the north. In his reasoning, which may not altogether be wrong, when a people are not exposed to robust education, they are easily manipulated and when that is achieved by any territorially minded leader, Shiite and Boko Haram are what you get.